The Stuart Monarchs bullied the courts forcing the judges to do their their bidding. Chief Justice Coke, believing Monarchs aren’t above the law, courageously withstood King James the First who then angrily dismissed the just judge. Coke told King Jimmy that he was bound by the common law, and tyrants never like words like “bind” being applied to them. Coke’s courage inspired future opponents of arbitrary government, especially the American Founders. Coke was read by lawyers well into the 19th century. America’s famous Revolutionary Orator, Patrick Henry, studied “Coke Upon Littleton” when preparing to become a lawyer. 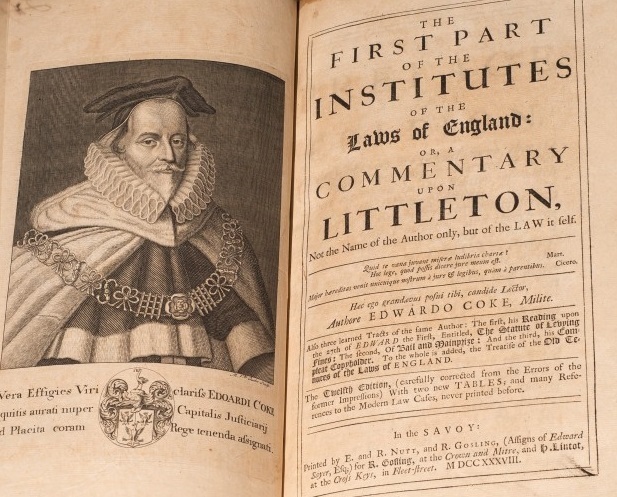 That book was one of Coke’s four-volume work called, “Institutes of the Laws of England.” The volume Henry read contains the text of Sir Thomas Littleton’s 1481 treatise on property with an English translation and commentary by Coke. Henry, with help from Coke, passed his law exams with flying colors. Patrick Henry was instrumental in standing up to the arbitrary acts of King George the Third. Sir Edward Coke’s works helped shape Henry’s thinking on the principles of liberty and Henry’s speeches in turn helped influence the thinking of all Americans as they faced tyranny, especially his Stamp Act speech in the House of Burgesses. Thomas Jefferson just so happened to be in the audience when Henry gave that speech. Jefferson, so inspired by Henry’s words, called that day the most important day of his life. Coke didn’t win all his battles, but he inspired those who came after him. We may not see the results of our work in our lifetime, but we can influence future generations. Imagine if Coke knew that his work would one day influence a Henry and a Jefferson, men who would in turn create a Declaration of Independence, a Bill of Rights, and the U.S. Constitution – in short, an Empire of Liberty and Reason!